Dominic's Journey, Mom's Journal: Tales from home based therapy - bikes!!! Tales from home based therapy - bikes!!! Daddy put the training wheels on Dominick's bike today. Dominic is in heaven. Mr. Jonny came over to do OT this evening and they went straight for the bike while there was still sunlight. Check it out. And this second video is the one that Jonny took as Dominic was riding up the street. Clearly, he needs some practice coordinating and in making his gaze steady so he doesn't fall down. That will come rapidly, we suspect. Then they came inside and got to work with handwriting. 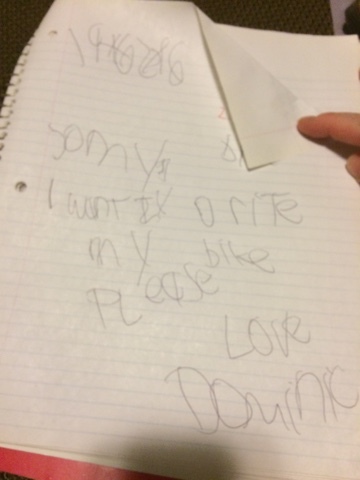 The whole time Dominic was asking to ride his bike, so we had him write Jonny a little letter asking to ride his bike. It's kind of hard to read but I do believe he gets his message across. Jonny said that if I had told him a year ago he would be getting a letter from Dominic ask him to write his bike within a year he would have told me I was crazy.